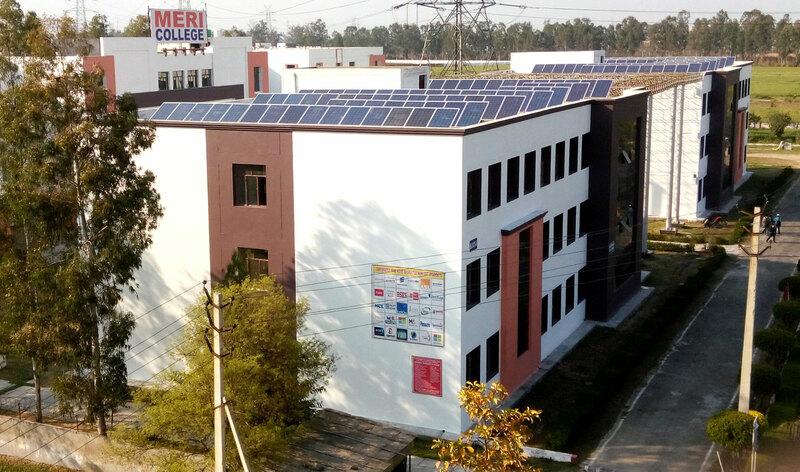 A solar photovoltaic power plant of grid connected type is designed for captive generation and consumption of electrical power from sunlight during daylight hours, for use in our MERI Collge, so as to reduce the electricity consumption from the very costly main grid supply, as well as to participate in the renewable energy program of MNRE. The capacity of power plant is chosen as 90% of the sanctioned connected load of 50 Kilowatt, for maximum allowed saving of electricity from grid. The complete photovoltaic power plant has two sub-plants of 22.5 Kilowatt-peak rating. The solar inverters are of string type, which work in synchronizaion with the main grid suply of three phase AC, and convert DC power from the arrays of Solar PV Modules to three phase AC power. The plant consists of 152 PV modules of 300 Watt-peak rating, connected in strings of 19 modules in series with 8 strings in parallel. The voltage, current and power capacity of the solar inverters is chosen, keeping in view the variations of voltage, current and power output of the PV modules with the ambient air temperature and the temperature of solar PV cells in the modules.